I really think life would be better for all of us if aspiring philosophers and current ed professors and everyone else planning on creating a new society and a different kind of human behavior used a word processing system that came with a Hubris warning. Beeping to alert that kind of presumption and conceit has always brought grief in the past. Maybe a squeaky voice could pipe up with a “Would you like to reconsider?” The overt goals laid out in the last several posts sent me back to rereading Bela Banathy’s Systems Design of Education: A Journey to Create the Future as well as what Donella and friends wrote in 1992: Beyond the Limits: Confronting Global Collapse, Envisioning a Sustainable Future. I wanted to see how closely these visions from the 90s aligned with what we saw being sought in those World System Models in the 70s and those recent Great Transition documents. Sure enough there is Bela talking about the need to “attain global consciousness and forge a global system of the human community.” Insisting that education has a new role of “spearheading societal evolution by design” and making me wonder if he ever took a history course. See what I mean about a hubris key coming in handy? I also discovered that soon after publishing that book Groping in the Dark in 1982, Donella and Dennis Meadows formed the Balaton Group named for the lovely lake in Hungary where meetings on Sustainability could be held that would allow members from the Soviet bloc to easily attend. http://www.donellameadows.org/from-sustainability-science-to-real-world-action-a-short-history-of-the-balaton-group/ Those of you about my age may remember those Alka-Seltzer commercials that went Plop. Plop. Fizz. Fizz. Oh What a Relief This Is. Easy access of schemers from East and West throughout the 80s to make plans for all of us under the banner of Sustainability. This just keeps getting better and better, doesn’t it? To make his point that “a system under which the talented and the skilled and industrious received no more than the incompetent and shiftless and lazy, and which equalized material rewards irrespective of effort, would certainly be unproductive; and to most of us, I think, it would also be unjust.” Hazlitt nailed precisely what concerns me so. We are risking “splendidly realized destitution” precisely because the planners and professors take continued production at the same overall global levels for granted. And by drastically affecting both knowledge and incentives all of these transformational plans and models create a great likelihood, that foreseeably to us if not to these decision-makers, the output or product to be divided is likely to be substantially diminished. Maybe they have learned. Is that why we are supposed to learn to make do with the quality of our relationships with each other? Just the price of oligarchical power? That leads us straight to the points of the other economist we are going to consult–PT Bauer from his 1981 Equality, the Third World, and Economic Delusion. Bauer reminds us that the term ‘differences’ is a more appropriate descriptive term in most instances than ‘inequality’ and he mentions the “accepted practice of referring to people’s physical characteristics, such as height, weight and strength, as differences rather than inequalities, and never as inequities.” Financial differences among people and countries “result from people’s widely differing aptitudes and motivations”, and to some extent luck. Bauer astutely looks at Africa and development policies in the third world generally and declares that “once the moral and political case for egalitarian policies is taken for granted, the movement for egalitarianism feeds on itself.” Something to remember as formulating social justice values becomes the Raison D’etre of both K-12 and higher ed. Which means equality and justice can be the slogan justifying what is being done but only genuinely entrenched inequality between the ruled and the rulers can result. Sustainability in action may seem more blissful than my references to Uncle Karl and that little c theory but the beggaring and self-perpetration of a malevolent process are likely to be the same in the end. Who knew studying the Middle Ages and serfdom and feudalism would prove to be so relevant to combating the fallacies in 21st century political schemes and toxic social visions? Foisted on us in the name of education. If you are like me when I initially encountered the true story behind education reform, you wish political change was not a crucial aspect to the story. Let’s face it, it’s quite off-putting and can seem to be quite kooky at first. It’s an unbelievable story except it’s a factually provable one even if it’s hard to believe. So like it or not I had to go there in my new book. And I have to go there now on the blog to give additional information about what is coming at us from our politicians and agencies but also from international groups like UNESCO and the OECD that can bind us without being on our radar. When I raise the concept of the little c theory of future human development from a certain notorious historical figure I mischievously refer to as Uncle Karl, or I simply keep reiterating the political purpose behind all these education reforms and the OECD’s PISA or the UN’s sustainability pushes and climate hyping, it is natural to want me to stop it. Keep it simple. Only tell the story from the angle someone is prepared to hear it from. That is really difficult to do though if we are to have any chance for avoiding this fiasco. Tracking all this over decades really does lead us to statements like “restructuring social, economic, and political systems was much more effective” in order to “bring about a desirable future.” So said one of the Club of Rome’s favorite world system modellers, Donella Meadows, in her 1982 book Groping in the Dark: The First Decade of Global Modelling. Donella conceded something that is crucial for understanding what the UN is really up to with its IPCC Climate reports since plenty of observers have noticed there seems to be little effort to reflect reality. That’s not the purpose of these models. Their purpose is to model social systems. There was a great deal of frustration at the 1978 6th Annual Meeting of the International Institute for Applied Systems Analysis (IIASA) that the book came from that the world’s environment and its social, behavioral, and political systems were so hard to model. Who else thinks that between the education reforms that began in earnest in the 80s and the Sustainability push that commenced via Our Common Future in 1987, the policy makers hit upon strategies to try to make people conform better to the desired model of the future? And a single world system that everyone in 1978 seemed to assume was coming into being over the next several decades. The Bariloche model from 1976 envisioned a world “in which human needs and human rights, rather than the desires to consume and to accumulate wealth, would become the basis for resource allocation.” And of course create the need for both a dominant public sector globally and docile masses capable of doing little more than Groping in the Dark. Except now with spiffier names like Competency and 21st Century Skills and Capability as a Human Right. Always essential to this vision though is a new way of thinking grounded in emotion that will see the world and its inevitable problems in ways that are beneficial to those who currently hold political power or would like to. Think of it as Mindsets suitable for an Oligarchy in power pretending it is really all about human needs, Gaia, and Successful Learning for All Kids. Let’s come forward in time to the culminating 2006 document outlining the Great Transition. Called “World Lines: Pathways, Pivots and the Global Future” it gives further insights into all the social and emotional learning and Whole Child pushes as a means of “cultural innovation and social adaptation” that call for “emergent social forms [that] were also realms of the heart that broadened the affective sphere of community and reciprocity.” And such realms are necessary now you ask? Well, yes, we are supposedly in a “pivotal” historical moment to achieve a “peaceful, just, and sustainable world.” Don’t you just want to start a list of all the troubling regions of the world that haven’t gotten the memo about the Great Transition we have embarked on? Do you think everyone will start behaving well if we just give them more of the world’s physical resources and learn to live with less ourselves? Lots less. How about if we use education to create in each student a “sense of planetary affiliation, kinship, and citizenship”? Is that the ticket to social justice or just more power and resources to an increasingly parasitic public sector that gets to pursue its self-interest at everyone else’s expense while acting as the administrators of the Great Transition society? Making education policy globally and the 21st century visions of governments at all levels about adjusting to “a global future based on human solidarity, human fulfillment, and ecological sustainability–a vision we refer to as a Great Transition” will be a not-so-great transition to devastation of everything that has ever worked. Transitioning based on incentives that have never worked for the benefit of anyone not connected to political power. “History has entered the planetary phase of civilization in which humanity and the biosphere are entwined in a common fate.” Repeat after me, none of us deserve to be classified as comparable to inanimate objects or as just another animal. Well, maybe certain notorious fraternities on certain college campuses. Here’s more of the attempt to diminish every single one of us as an individual and to try to make us mere parts of a greater whole with no fundamental right to our own decisions. Now if you thought the communitarian aspects of all these sought social reforms were intrusive, who exactly will any of us be in a “unitary global system” apart from a source of tax revenue and needed labor in a world where all of the incentives have been perverted to chase after a possible future? I did not lay out all this info to scare anyone so much as to force us to see the vision that people with considerable power and access to the coffers of public money really are pushing on us. Now. The actual common core to be cultivated in everyone is a “new suite of values-human solidarity, quality-of-life, and respect for nature” that will be the foundation for a public sector administered “egalitarian social contract, poverty eradication, and democratic political engagement at all levels.” Right. Plus unicorn rides every Wednesday. We apparently really are at a historical moment. Will the independent individual really cease to have political legitimacy in the 21st Century? Now unlucky me has spent enough time immersed in all these political theories to recognize when I am looking at a description of Uncle Karl’s little c vision of the future. http://www.invisibleserfscollar.com/naming-educators-as-the-levers-shifting-the-human-personality-to-marxs-moral-revolution/ is where I first addressed why changing values and beliefs is so crucial to achieving this little c vision. And it’s not about Lenin or Mao but it remains toxic to the individual and freedom in the sense of what created the West. Today I want to focus on all the current official publications that verify just how right I am as to what is really being targeted and why. All through the 70s Arne Naess’s books were bestsellers in Norway for their ecological visions of a new type of society. To prime the West towards a comparable vision of the future in time for the 90s efforts at wholesale transformation, his book Ecology, community and lifestyle was helpfully translated into English in the late 80s. He pointed out that ecology is where the socialist crowd was migrating because it created a belief in the necessity of political change. Central to these efforts is always a “change in consciousness.” As Naess graphically put it, the change “consists of a transition to a more egalitarian attitude to life and the unfolding of life on Earth.” Remember it is the Axemaker Mind that builds on existing cultural knowledge to invent technology and tools that can manipulate nature for man’s benefit. The “unfolding” vision wants people to merely be another creature. Very useful vision for political leaders, bureaucrats, and business leaders wanting to play future overlords and preserve current power. Not so good for the rest of us peons to be administered. And coordinated they are. It’s why education leaders are such a crucial component of the visions set out at a (co)lab in Atlanta or the cityLab in NYC recently. It’s also why education is so crucial to the UN and the OECD’s plans. Following up on the OECD’s expressed intentions for change at its most recent forums led me straight to this transformational vision http://www.gtinitiative.org/documents/issueperspectives/gti-perspectives-premises_for_a_new_economy.pdf . It’s the kind of wholesale redistribution vision that would have made Uncle Karl weep with joy over his continued influence. Typical people should note though that this vision plans to take the world’s existing wealth and redistribute for the benefit of the poor in countries in the North and to raise living standards all through the Southern Hemisphere. It also involves shifting globally from a profit economy to a ‘needs’ economy in the 21st century. Essential to that vision which we have already encountered in Shoshana Zuboff’s support economy book and the Aspen Institute pushing a Fourth Sector “for benefit” economy (see tags) it will “also be necessary to develop non-consumerist ways of understanding and being in the world.” Now won’t all the current reforms in K-12 and higher ed and the expansion into preschool be useful to such goals? How about an article published last month in the Journal of Human Rights and the Environment by Burns H. Weston and David Bollier which seeks to use Martha Nussbaum’s work we have talked about “as the theoretical means to restore ‘the obligation of result’. This would thereby move the discussion from the abstract to the concrete…” Why, yes, it would. It means we are trying to use education at all levels to create mindsets that will come to use the law and capability theory to impose Uncle Karl’s little c vision on societies without saying so. It adds a new C though. Our children are to be “college, career, and citizenship ready.” And if you are wondering what kind of citizenship CCSSO has in mind they go on to cite their sources and usefully mention every controversial report I have ever written about on this blog down to rejecting the individual mind and mandating communitarianism through the Career Tech guidelines. Thank you CCSSO for your hubris in that document. People trying to criticize the idea of national education standards have begun to use the phrase “Commie Core” to attack the Common Core State Standards. The irony is if you track CCSSO’s actual planned implementation and the agendas of its named partners in developing classroom curricula and assessments and you compare it to Uncle Karl’s actual vision of little c communism, you get a match to the values, behaviors, dispositions, and mindsets to be fostered. Perhaps a more apt phrase then would be the Commie Core designed to aid the Great Transition whether we consent or not? Designed to be implemented while we are still unaware of such wholesale changes or wrongfully believe this is about the transmission of academic content in the 21st century. That was the plan in the late 80s. In 2013 it feels as a parent like all those smaller steps are being pushed in a frenzy at the same time. Some people have become very impatient for transformative change that benefits them but not us. And hardly anyone recognizes what is happening. At some point in the last several years someone put up on old interview of President Obama when he was an Illinois state senator where he complained about the US Constitution having a premise of “negative liberties” instead of obligations of when governments must act. Now I have been a bit too busy to spend my time fretting over shifting views on the nature of the law but that video came roaring back to my mind as I explored Martha Nussbaum’s “capability as a human right,” Harvard’s decision to push CRT–Critical Race Theory–in K-12 to eliminate structural differences in society thought to affect Blacks and Latin@s (not a typo this is how book shows gender correctness with Latin nouns now I suppose), and the American Political Sciences Association’s April 2012 report pushing Economic Citizenship. All this social justice theorizing that is committed to education that levels the best and brightest and deplores any Constitutional or other legal interpretations that would focus on “negative rights [that] disempower the state from intervening into the private sphere for the democratically progressive purpose of redistributing power or resources within it” are all grounded in the erroneous belief that economies and wealth are about a fixed, finite, tangible, sum of goods and property. In other words, that’s the “materialist conception” the political theorists are referring too. All of this theorizing being launched at us now through the spending and regulatory powers of federal, state, and local governments and the education policies I have laid out on this blog and in my new book forget that the prosperity creating capitalism (not the Crony Corporatist variety that is usually parasitic) that we take for granted is mostly psychological. It is about “qualities of thought and spirit” in relatively few people who have the requisite “imagination and purpose, which make wealth” that in turn make all of us better off. Because those unique ideas and effort created goods and services we voluntarily wished to buy. With our own money. In pushing mind arson in K-12 and our colleges and universities to supposedly gain equity in a finite world and the psychologically manipulative “engaged” learning for the Whole Child to create “empathic solidarity” that will support political power massively redistributing this supposedly finite bowl of goods, we forget that mass prosperity has always grown from the “metaphysical capital of human freedom and creativity” as well as law that applies equally and predictably. Not law that applies unequally to various groups to try to shift opportunity and outcomes in politically chosen directions. The rule of law matters so much because morale and inspiration, coupled to deep knowledge that takes precious time to build up, are critical to the genuine “conscience of capitalism : the awareness that one must give in order to get, supply in order to demand.” We are instead looking at a 21st century political, social, and economic vision grounded unabashedly in communitarianism that says ” I exist, gimme” and “governments, you step in and make it so and we will reward you with our votes.” But prosperity-creating wealth isn’t physical, it’s psychological. This redistributive zeal based on mistaken assumptions ultimately destroys the very essence that drives all economies that have ever worked for the benefit of broad masses of people. In other words, in this zeal to get to a Good Society/cooperative commonwealth /economic citizenship/capability vision for the future we are extinguishing the very basis for the wealth planners and politicians and naive educators believe everyone can live on as a matter of “right” in the 21st century. Let’s take a look at what is being demanded as a matter of “right.” The APSA report called “Democratic Imperatives: Innovations in Rights, Participation, and Economic Citizenship” certainly supports our speculation in the recent Bruno Latour post that all these current mentions of innovation mean sociological inventions that consume existing wealth. Not the wealth-creating, Free Lunch for Others, kind that created the unprecedented economic prosperity and living standards of the modern world in the West. No, APSA simply declared its determination to push “human-rights based approaches to democratization, welfare, and development” that will be based on “participatory governance.” Notice that “-ance.” An ability to bind all of us with no recourse for an individual because I am seeing that term in OECD documents tied to their education and subjective well-being/welfare state agendas all over the globe. APSA kindly lets us know the reason as “participatory governance is a process through which [created now via law reviews or federal agency overspending] rights are exercised and citizenship and political agency enacted. [in a majority will takes what it wishes sense of we take the benefits of ownership and you pay the taxes]. It can help bring traditionally marginalized groups into politics and can enhance accountability [to the will of those groups], responsiveness [ditto], and social justice. Participation is a vital element of rights-based approaches, [I have little doubt of that or why a community organizer would disdain ‘negative liberties’] and rights facilitate political participation. [As the place where give me demands are made]. Let me include the definition of economic citizenship after I first point out that APSA is insisting that this program with its “inclusive, pro-poor” emphasis is premised on the factually untrue “key finding” that the “more egalitarian and democratic the state, the better its overall economic performance.” So once again, as happens so often in education, we are enacting policies and theories based on factually untrue premises. And we wonder why we spend so much with such poor consequences for all those dollars. “Economic citizenship refers to the substantive aim of making economic security and social justice entitlements of democratic citizenship. It is, in a sense, the objective of human-rights based approaches, and it, in turn, enables meaningful political agency.” Well, of course, it does in a collective and groups matter but the individual does not vision. As Georgetown Law Prof, Robin West, put it in her 2001 aspirational Law Review article “Rights, Capabilities, and the Good Society” where we also took that negative rights ‘disempower’ quote above, the state is obligated to provide that “threshold level of material well-being” that is necessary for ALL citizens to “be able to be free and equal participants in the collective project of self-rule.” Those individuals not wishing to be bound will discover why those 5 little letters in ‘governance’ are to prove so binding. And “equity” and poverty and race become the excuses for a public sector-centric vision globally for the 21st century. Professor Wright’s sense of the law strikes me as indicative of someone who has lived their life safely ensconced in an Ivory Tower but deluded does not mean not influential. Unfortunately. She finds it reasonable that citizens should be able to “demand, that the law both can and should structure a decent social world” as if ‘the law’ were a magic wand that does not first take whatever resources it plans to spend as politicians see fit. In fact, she believes “states and state actors” should “focus on the utopian aspirations we might universally hold, and then to bring that vision to earth.” How magnanimous of her! Respect for Individualism might be the crucial ingredient in the economic prosperity professors like Robin Wright or Martha Nussbaum or those Harvard CRTers plan to try to redistribute using legal theories and political power and new education visions. Only later will we all understand these huge fallacies in what is now being pursued in earnest. From so many different directions and levels of government. With these plans and theories we all may be about to learn a huge lesson in what really creates living hells. Generally they come from the misuse of political power. I guess they don’t teach that these days in law schools or education graduate schools. Certainly not in the psych or sociology or political science departments. Too bad. I have now discovered that when Amazon says it will take 5-7 business days for a book to be listed for sale not to take them literally. More like two hours actually but then the journey to bringing a book to print is an odyssey of twists and turns. In my case the book was written and then put aside as I started this blog in response to alarming developments as the actual Common Core implementation took on an increasingly psychological and communitarian focus. I took on the role of Paul Revere and have been writing away, instead of riding, to spread my concerns over what I was seeing in current documents as I monitored all the announcements and reports that continue to come out weekly. When concerned people would ask me why I was giving away the book, I would always say that I wasn’t. The blog was and is a separate creation. In many ways it turned into a second book told in a serial fashion as I reacted in horror to whatever I saw coming at us. But early this summer I picked the manuscript back up knowing the story needed to be out this fall. Although I did use the knowledge developed from the blog’s research to reframe slightly how I presented the story weaving through the book, by and large, the book had simply become even more relevant while it sat quietly on my hard drive. 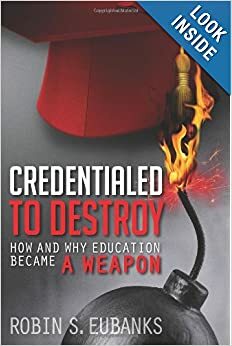 Here is the link to Amazon where anyone can now find it http://www.amazon.com/Credentialed-Destroy-Education-Became-Weapon/dp/1492122831/ref=sr_1_1?s=books&ie=UTF8&qid=1381695681&sr=1-1&keywords=robin+eubanks . Those hoping for a Kindle option, that will be available in a couple of weeks. Lots of citations require specialized professional conversion. I named this announcing post “Propitious Timing” because I have had numerous reasons in just the last week to recognize how many nefarious things that relate to what I explain in the book would still be going invisibly forward otherwise. Now at least we have some chance of putting it all into proper context. Giving us an opportunity to fight off the kind of visions I have laid out in recent posts. Education Week was on a roll on October 9th alone. It posted “Racial Equity 50 Years After King’s Speech” and then “Transforming Our Schools Requires Building Our Democracy” which stated rather preposterously that “only public institutions have the capacity to be rigorously accountable to the interests of communities.” That may make a nice pitch to increase power in the public sector but it is nonsense to anyone who has visited the DMV or a tag office. But the real shocker to me, consistent with what was clearly building up as the drumbeat for social change, was this article “Our Nation’s Schools Remain Contaminated with Inequity.” http://blogs.edweek.org/edweek/op_education/2013/10/our_nations_schools_remain_con.html It was a reminder on why it has mattered so much that someone telling this story is also a lawyer. We tend to recognize when someone arguing that the “law requires” is actually just hoping everyone will take that assertion as a given. And not recognize that current laws do no such thing and the writers are arguing aspirationally. What they wish the law said. I have seen that more and more as the law is seen not as a set of agreed-upon rules common to everyone but a tool for advocating social change. That is especially the vision of the book Contesting the Myth of a ‘Post Racial Era: The Continued Significance of Race in US Education written in 2013 by that article’s co-authors. Our political transformationists with their visions of a communal future have real plans for all of us and they see education as their premier weapon. But we are right up there with them and ready to follow in real time what is being sought. As I said: propitious timing. And yesterday Ron Radosh and David Horowitz issued a story and and old letter about one of England’s dedicated radicals, Ralph Miliband. http://pjmedia.com/ronradosh/2013/10/12/how-david-horowitz-revealed-the-truth-about-ralph-milibands-legacy-what-it-should-teach-the-british-left/#comments I had never heard of him but apparently his son Ed Miliband is the current head of the British Labour Party and a possible future Prime Minister there. Apparently on October 1, a British writer said that Ed wanted to bring about his father’s vision of 21st century socialism. Up arose a dispute as to how radical the father was with Ed disputing what had been written and Horowitz responding with the old letter he had written. Asking why Ralph Miliband continued to push socialism in the early 90s after so many tragedies. Again propitious timing. Ed Miliband’s response reminded me of a quote I use in the book that if what is being pushed is accurately perceived too soon “we will have to pull back.” Plus Horowitz’s long Open Letter reminded me again of the dangers of so many of the aspirations we are now seeing everywhere. Laid out in the book over decades of influential scheming and it is clearly still coming at us in the Relational Pluralism vision above. It’s also apparent in the ideas now pushed by UNESCO and the OECD via subjective well-being and capability as a human right and a return to Scientific Humanism as Irina Bokova is now advocating. I wish this was not all going on but I am very glad that between the book and the blog we are going to be in a position to see what is coming at us. We will need to perceive all of this accurately in order to fight for the continued legitimacy of the individual in this vision of a transformed future. Harlan’s vision remains current in the US and UK and many other countries. Led via poorly understood education reforms. Designed to take us all towards a vision of collectivism none of us have consented to. I wish these stories from the blog and the book were not true. But they are and it is all well documented. I am glad that because of propitious timing we can hopefully make enough people in enough places aware in time to turn away. Do you ever read one of my posts and think “surely she’s exaggerating. That cannot be the actual intention. This is America and we are a free society.” Well, maybe less after this past week of barricades blocking open-air monuments keeping veterans from honoring those they served with. Or the elderly tourists being herded and guarded at the Old Faithful Inn lest they actually see and take a picture of an active geyser. Or those orange cones trying to block anyone gaining a view of Mt Rushmore. Plus the mentality that would add to the pain of already grieving families while they are still in shock by essentially telling them politicians and executive appointees did not value the ultimate sacrifice in the least. We have indeed crossed the Rubicon because of the importance of using the federal spending, taxing, and regulatory powers to enforce a different sort of country and society. Without we consent or not. We think this past week is all a bridge too far when the reality is the transformation is just heating up. Let’s take a hard look then on where we are being led and why and what makes education such a vital weapon for intentional, nonconsensual cultural change. If you are a new reader, I usually refer to Karl Marx as Uncle Karl when I have to go back and pull up his theories and philosophies. Because people are writing that their current plans trace back to him. Still. In 2013. And simply saying that “Karl Marx said” makes me sound a bit hyper instead of ably tracking real declarations and then telling the story with a bit of humor. So if the MIT Press in 2012 decided to publish Ethical Adaptation to Climate Change: Human Virtues of the Future with regular mentions of that notorious Uncle as if he were a respectable theorist with good, untried ideas for us all, we get to take a hard look at what is in store for us. I see that the Aspen Institute and Bloomberg Philanthropies sponsored CityLab this week in NYC http://www.icic.org/connection/blog-entry/blog-cities-as-the-engines-of-economic-prosperity building on this idea that the Inner Cities are to be new totally managed systems that all federal policies revolve around benefiting. This confab, like the (co)lab summit 2 weeks ago in Atlanta, TED City 2.0, the Brookings Metropolitanism push, and the new Promise Zones initiative announced in August with 11 federal agencies coordinating “prenatal to career nurturing of pathways” are all the second term pushing of what I first described here http://www.invisibleserfscollar.com/well-no-wonder-no-one-listens-to-common-core-complaints-if-it-is-tied-to-federal-revenue-sharing/ . What is going on now in education, and what our 3 theorists from the last post wanted, and all these redesign the world through concentrating on the cities advocates desire, all make much more sense if you realize lots of people believe that the “problem with capitalism and the market economy” is the “private character of decisions.” Immediately telling me the writer has no clue as to what is involved in becoming successful in the non-cronyistic economy where you can only do well if you give people something they volunteer to buy. The point is the public-sector centric theorists have a desire for a future where the public sector can force people “to decide together what they are going to do” so that they will “act in concert to produce the result they all desire.” And you are thinking why would everyone desire the same thing? Like it or not, that is the official mantra of the 21st Century vision all over the globe. Man-made climate change is being constantly touted whatever the reality because its solution requires a shift from individuals and markets making decisions to collective, majority binds all, decision-making. And education becomes about reenforcing a human responsibility to change and to engage in a ‘common politics’. Each person must now always consider “what actions would be discursively justifiable to others before acting.” Now that is clearly just a motto to gain power or we would never have seen the events of the past week, but it is the official view of citizenship in the future that our K-12 schools and higher ed are to actively cultivate. Mental transformations in individuals, new cultural models, and new institutions are absolutely precisely what this 2012 book lays out as the intention. Like it or not, this is the genesis of the vision of the future being pushed now all over the globe. It is the vision behind the ambiguous term ‘Sustainable Development’. I may not be able to make this all go away by myself, being a mere individual and all. But what makes individual minds such a target in all these 21st century calculations is precisely the concern that someone will piece together the story in time. Before the mental and cultural changes are ‘irreversible’. And the new institutions become entrenched. Now you know. Hope there is still time for the sleeping giant to awake to this danger we are in from our political class and their eager cronies. To the extent education reforms going on globally in K-12 and higher ed are even on people’s radar, most observers still believe the dispute is over how to best transmit knowledge. And who gets to decide the type of knowledge that is needed. It is hugely convenient for the advocates of wholesale social, economic, and political transformation in the 21st century that we all continue to misapprehend the nature of the actual debate and the tools being used to drive the desired individual and cultural changes. To help us all bridge the gap between what we expect from schools and higher ed and what these reforms intend to actually do to our children and us, I am going to use quotes from 3 people whose work is at the center of the current transformation globally. That would be the purpose that now gets hidden under the euphemism “College and Career Ready.” And the ‘culture’ and ‘citizenship’ students are being groomed for is grounded in the transformative vision of the future to prime the students to take action to help bring the new world into being. The great advantage of deemphasizing textbooks and lectures and mandating virtual reality gaming as assessment or using group collaboration around the ambiguous real-world grounded “wicked decision problems” from the last post is we are creating young people who will have the right to vote with virtually no capacity to anticipate even the likely consequences of the transformative actions being taken. The insider phrase for this new emphasis of “skilled in the fundamental pragmatics of life” gets omitted from the public sales pitch as too accurate to be acceptable. Let there be no impediment to future action and let the actions be grounded in the cultivated feelings and values and attitudes that live in the unconscious regions of the self could easily be the new motto of global ed reforms. Let’s move on to Chicago Professor Martha Nussbaum who we first met here. http://www.invisibleserfscollar.com/isnt-it-political-sabotage-to-use-education-to-eliminate-the-assumption-that-students-are-individuals/ Her work on capability as a human right has increasingly caught the OECD’s and the UN’s attention as the appropriate theoretical vehicle to push for a public sector dominant society and a new kind of welfare state for the 21st century. Apparently we are not supposed to notice the marked resemblance of capability theory to Uncle Karl’s human development theory of the future. “ponder what is implicit in human dignity and a life in accordance with it…Marx’s vivid descriptions of forms of labor that allow continued life, but not a fully human life, resonate the world over. The notion of life in accordance with human dignity is one of the most fertile ideas used in worldwide constitutional jurisprudence.” Ahh, tenured academia–where the term Marx is actually not a pejorative insult but a still revered architect of future ways of organizing life and a society. Later, Nussbaum kindly tells us why it is so important now to have a Whole Child, social focus that grounds all thought in emotion and then uses new assessments to both drive and measure how schools are doing in driving such “growth.” It is “how we might cultivate the helpful sentiments in a socially propitious way.” Those would be the sentiments that will hopefully ground the actions for transformative change with again little ability to recognize likely disasters that would be apparent to anyone with a solid knowledge of history. “politicians can build a public culture that puts altruism and the relief of misery at it core. …An account of the emotions of citizens in a decent society is urgently needed. In other words, the survey Nussbaum says is needed is precisely what the White House-pushed League of Innovative Schools and the EdLeader21 suburban US school districts have now agreed to research and gather data on. Not to mention all the data being thrown off by the Executive Order mandating Positive School Climates or requiring Positive Behavioral programs for all students under an indefensible reading of federal disabilities law or via adaptive software programs used in the digital learning juggernaut. You’d almost think Professor Nussbaum knew people in DC who could help drive her theories along. Now Bruno Latour is a name familiar to me because of his role in the ‘science wars’ of the 90s. Plus he is a hugely popular choice as a campus speaker now. A French sociologist. So when I saw a 2004 book of his cited–Politics of Nature: How to Bring the Sciences into Democracy–that Harvard published, I thought we could gain more insights. Confirmation that what is being billed now as ‘innovation’ is really a push for sociological experimentation. A truly shocking book for Harvard to have embraced and for the French government to have originally funded. Reading that the “social sciences would finally become scientific if they agreed ‘to treat humans as things” made me feel like I had slipped into a Hollywood script for a science fiction mini-series. No such luck though. These are real and current aspirations we are dealing with. Roughly translated that seems to be public officials deciding what to do, then how to do it, and then examining how they did and considering what to do next. All as if public dollars will always be there for the asking to pay for such social transformations even though everything that has ever produced economic wealth is being squelched to get the mindsets that will go along. Justifying statism in the name of equality and justice is another way of looking at this genuine aspiration. That gets linked to the Common Core and other global ed reforms because they are all seeking precisely the same kinds of minds and values that Latour believes are needed and the OECD now counts as Competencies and government officials are calling “higher order thinking skills’ created by “rigor” in the classroom. Latour actually believes like John Dewey that such a concentration of political power and binding all citizens to the results of majority will (that is in turn cultivated by what is to go on in schools and universities) need not lead to totalitarinism. He really says that Nazi Germany and the Soviet Union simply had the wrong kind of politics and vision injected into their collective decision-making. I am thinking that tenure and being able to live at public expense or courtesy of untaxed endowments held by universities and charitable foundations has seriously left way too many influential people who already have utterly no conception of likely consequences. Too much theory and not enough reality apparently is possible now on many a campus, think-tank, foundation, or government agency and it shows thoroughly in what is being pushed on all of us. Who pay the bills and who are to have nowhere to turn if these visions continue to advance via education and cultural transformation. Reality and Consequences do not care. If the likely consequences appear to be a nightmare, remember the unforeseeable ones we will also encounter. Instead of cultivating new conceptual lenses and minds for students, we need to impose reality checks on a whole lot of adult professors and bureaucrats and politicians. Well, of course, we wouldn’t. That’s the beauty of the misrepresentations surrounding the Common Core and charters with duplicitous language actually mandating Maslow’s psychological model of growth or the lack of genuine appreciation for what the OECD’s PISA ‘test’ is measuring. It makes the end goal of a revolutionary new purpose for education on automatic pilot towards fruition even though no one would agree to it voluntarily with their own money. Despite the fact that warning after warning is out there in the small print that this is all a massive psychological experiment designed to gain a nonconsensual political and social transformation. Starting at the level of the student’s personality. Now the letter http://blogs.edweek.org/edweek/curriculum/CCSSO%20Assessment%20Quality%20Principles%2010-1-13%20FINAL.pdf did not actually say that but when you track back what it did say about what constitutes “high quality assessments” and “deep knowledge” and the ancestry of the term “higher order thinking skills” instead of surface knowledge back about 25 years that descriptive quote I wrote up is precisely what you find. Especially if you go further and click-on the “Criteria for High-Quality Assessment” issued in June 2013 https://edpolicy.stanford.edu/sites/default/files/publications/criteria-higher-quality-assessment_2.pdf . These cognitive psychologists and education profs are saying no, human will exists but we can use pedagogy and theories of education to both shut it down and guide it in desired ways. Since we would all rebel if that was the way these reforms were presented, they are not being phrased that way. To us. In the materials we are supposed to use to frame our beliefs and attitudes toward education reforms. But I track down to the insider-only material that gets withdrawn from library shelves for a reason and it is quite clear. In fact, the commonly used term “college and career ready” is clearly a play on gaining over time a progression of how students “create our conscious structuring of the intersubjective world of everyday experience” so that each student structures their vision of reality in the way desired. Over time these motivationally misleading situations and wicked-decision problems are supposed to create empathy in the student towards others and the world. To be “developmentally sophisticated and advanced” in this vision of education, what is desired in future students is to be “humanistically oriented or psychologically ‘spiritual.” Now you know why we just kept encountering such a psychological emphasis as we explored the real Common Core implementation and why there is so much deceit and misleading definitions to so many terms. Being upfront and declaring you are seeking a personality suitable for the illicit political revolution may be true but it would make for a bad PR campaign. Now I have explained this psychological model before.Yesterday’s letter simply clarified how important a particular kind of assessment is to the vision. It’s how the psych model gets mandated in the US and globally without admitting it. This psych model by the way has long been pushed in urban school districts. It’s just that now it is being foisted on the suburbs in a way that is not supposed to be visible. I am very concerned though by the widespread belief among many minorities that the only way for them to succeed is to push this psych model on all schools. It’s the economy as a fixed pie belief and they want government to intervene to give them a larger share. And the economy is not a fixed pie and the way governments are intervening to push this Competency model as the goal for all students will ultimately be the death knell of mass prosperity. It’s just not appreciated yet. There has been an awful lot of racial hatred that has been nourished over the years to get this psych model and the overall political transformation in place. Breaks my heart to watch and hear. Commenting on a similar push in Brazil a WSJ letter to the editor pointed out how hard it is to contain “the populist forces of fairness and change once unleashed for political gain…[E]conomic success overseen by leftist populists intensifies the hard-left passion for absolute social justice and equality.” Yes, and that is precisely the blood lust these ed reforms and the Inner Cities vision and all the movies being pushed now on inequality are building up. Not bothering to point out that the public sector dominant remedy being pushed ultimately brings less prosperity for most of us. I would add that now the enthusiasts are blindly or greedily insisting no one may have navigational skills in the future either. Then where will we all be?